Hockey Plumber: Gamesmanship: Should Washington Capitals Coach Bruce Boudreau Just Shut Up? Gamesmanship: Should Washington Capitals Coach Bruce Boudreau Just Shut Up? Is is safe to say that Caps Coach Bruce Boudreau was no fan of Greg Louganis? Boudreau is well know for his penchant for unleashing the quote machine during post game interviews, particularly so after a loss. However, the coach's machine got started up before a big divisional showdown with the Tampa Bay Lightning. "We don't like the way they dive every two seconds and they lead the league in power play attempts because they've got guys like [Steve] Downie -- even though he might not be playing tonight -- who if I was a referee I would never make a call on him ever because he dives every two seconds," Boudreau continued. "[Steven] Stamkos, dives every two seconds. You start to get a hatred on for guys like that. So, it will be interesting." "We all know he's trying to influence the refs for (Monday's) game," said Boucher. "I have too much respect for the players' dedication, mine and his, to even think that is possible. Referees are smart and more competent than people realize. Besides, Downie and Stamkos have the most minor penalties on our team, it's not like they're getting a lot of calls going their way. I think (Boudreau saying Stamkos and Downie are diving) is ridiculous." "Steven Stamkos does not dive. He doesn't do that. He plays the game with integrity," said Yzerman on Monday. "He fights through a lot of checks. He plays the game the right way. I would hate to think someone would make a statement that isn't true and people out there would think a player like Stamkos is going to get a reputation for something that he doesn't do. "Steve Downie is not a diver. Steve has worked hard since he has came into the league to improve the way he plays the game and he's continuing to work at it and we really like the strides he's made. But diving is not something I would say is now part of his game." "We would like to think NHL referees are smart enough to see what's going on here and that this is nothing more than gamesmanship." Well, did the "gamesmanship" work? Washington won the game 2-1 in a shootout, but Tampa won the penalty war with five power play opportunities to four for Washington. No penalties were assessed for "diving." Was Boudreau out of line with his pregame comments? 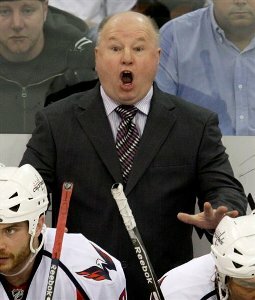 In the same way that Stevie Y is always measured and elegant when he speaks, Boudreau is loose and crass. It's just his schtick. As far as the gamesmanship of attempting to influence the referees... we just can't envision the officials sitting around listening or reading a coach's barbs at another team and reacting by saying, "Yeah, that guy has a point." If you watched HBO's 24/7 series leading up to this year's Winter Classic, then you know that Boudreau will use negativity to motivate his team just as often, if not more so, than positive reinforcement. So why wouldn't he use it to distract the opposition from focusing on the game? That's the kind of gamesmanship we see here. Are Stamkos and Downie divers? A few people have attempted to use statistical evidence to figure out if someone dives, but unfortunately, the NHL doesn't keep a diving stat. Penalties drawn are often cited, but don't really tell a story on a guy faking his team's way to the power play. Like NHL Rule 64.1 (Diving / Embellishment) it's a discretionary call. All too often the team that you are rooting against seems to have eighteen divers dressed on any given night, while your team has the same amount of pure-hearted, integrity fueled, worker bees that would never, ever try to buy a call. Let's face it, there aren't any teams in the NHL that don't have some guys who will embellish a bit to help their team gain an advantage. It happens. Does it mean those who do it occasionally are serial frauds? No way. Boudreau may not have a refined manor, or even be right, but he got people talking/thinking about what he said. Most importantly, his team got a win; and we are pretty sure that's what he was looking for when he "dove" in to the subject matter before the game.